There have always been insitutions of comedy: places where the sheer concentration of talent has made them greater than the sum of their individual parts. These Comedy Institutions have consistently nurtured some of the best and brightest comedy minds over the years. 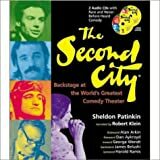 From legendary comedy theaters like Second City and The Groundlings, to revolutionary television shows like Monty Python and Saturday Night Live, these institutions of comedy continue to inspire and produce the stars of tomorrow. David Morgan · Monty Python Speaks!